The goal of this meeting is to discuss the creation of a regional natural gas vehicle alliance similar to the Texas Natural Gas Alliance. A previous discussion was held with Arkansas utilities in 2017. Oklahoma has recently expressed some interest as well as Louisiana. This Alliance will support the efforts of the Clean Cities program in all three states. Any and all events that are held – from member meetings to educational workshops – will incorporate the Clean Cities Coalitions. Based on this goal, key players would be natural gas operators, utilities, natural gas equipment suppliers, state and local officials, and public and private fleets. Susan Shifflett, President of S3-Services and President of the Texas Natural Gas Vehicle Alliance, will moderate the discussion. She has worked in the natural gas and propane vehicle markets for over 20 years. Ms. Shifflett focuses on developing new and expanding natural gas transportation markets and refueling stations in the State of Texas using industry initiatives, government programs, energy education, and community relations. 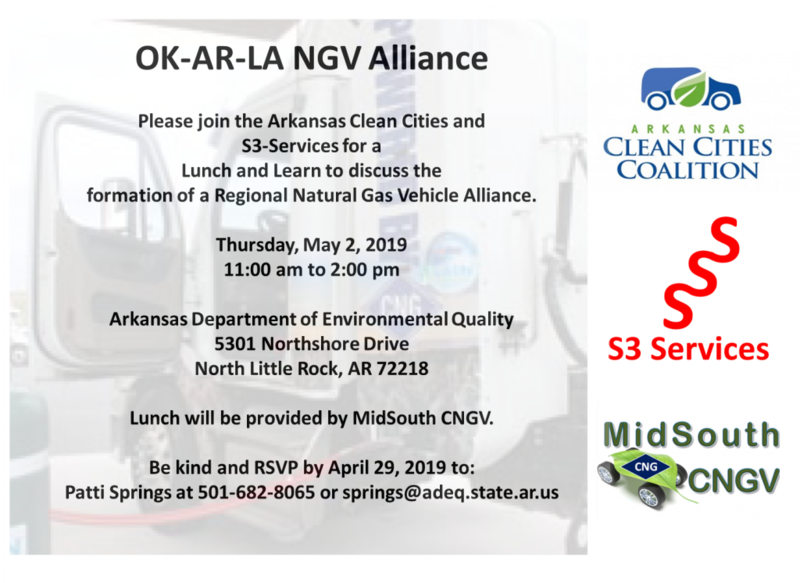 The Arkansas Clean Cities Coalition works to build partnerships to advance affordable, domestic transportation fuels and technologies throughout the state of Arkansas.